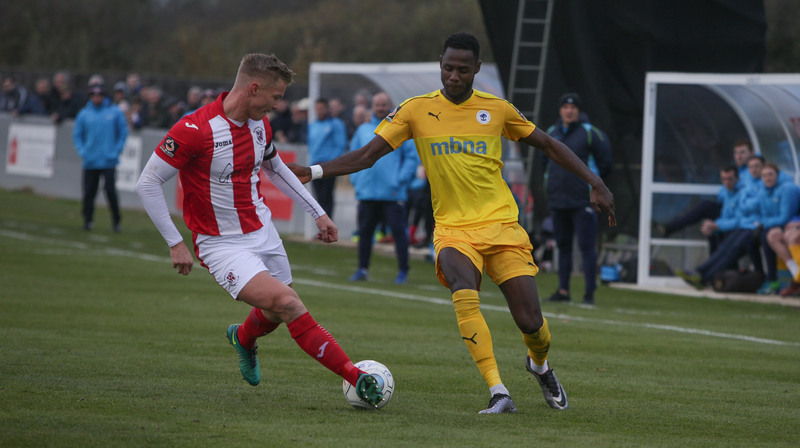 A brilliant Dan Mooney strike saw the Blues make it ten games unbeaten in the National League North – as Chester snatched a point in Northamptonshire. The Blues twice went behind, goals from Connor Franklin and Shane Byrne, but Mooney’s sublime brace secured a point. Anthony Johnson and Bernard Morley made one change to the side that defeated Ashton 4-1 in midweek – as Academy Graduate Iwan Murray made way for Emmanuel Dieseruvwe. Dieseruvwe had the only real chance of the first half for the visitors. His spin and shot was deflected but saved well low down by Danny Lewis. But Brackley had the advantage in terms of chances in the opening half. Ndlovu forcing Grant Shenton into an excellent one handed stop at the start of the half, before striking the side netting at the end of it. In between those opportunities, Shane Byrne’s set piece deliveries caused problems – with Gareth Dean heading over before likewise Connor Hall missed the target by a couple of inches. The game then suddenly sprung to life in the second half. The hosts took the lead on 50 minutes, a cross clipped in from the left was headed goalwards by Ndlovu – forcing Shenton into a stunning save – but he could do little about Connor Franklin lashing the rebound into the net. The Blues needed to muster a response and got one on 58 minutes. Nice link up play saw Dieseruvwe set it up for Mooney to strike from 25 yards – and the Fleetwood loanee found the top corner and his sixth of the season via a slight deflection. Nevertheless, they committed a footballing cardinal sin and switched off from the restart. 60 seconds later Matt Lowe did well on the right and cut it across for Byrne to charge into the area and stab home. The Blues threw bodies up the pitch in search of a – perhaps undeserved leveller; and they got it in the fifth minute of stoppage time. It was the magic of Mooney again, a loose ball in the air 25 yards out saw the Fleetwood loanee swivel and volley into the goal. What a fantastic end for the Blues to bag a point. CHESTER FC: Shenton, Moran, Howson (Deane Smalley 83), Livesey, Grand, Mooney, Stopforth, Roberts, Mahon, Dudley (Pritchard 78), Dieseruvwe (Jordan 88). SUBS NOT USED: Dom Smalley, Murray. SCORERS: Franklin 50, Byrne 59; Mooney 58 & 90+5.